One of Capt'n Kenny's favorite destination is Spain. This is a country with a strong seafood cooking tradition. Scallops and shrimp recipes from Spain go from very complicated to very simple, but they have a constant characteristic, they are all delicious. Scallops, shrimp, mussels, octopus, squid, clams and so many other "fruits from the sea" as they call them, are prepared in the most creative ways. They have to. Spaniards, like Italians, live to eat and enjoy their food. Whenever you visit as Spanish home, you will for sure leave with a full, happy stomach. Hence the reason for so many scallop recipe ideas and shrimp recipe ideas including Saffron. One of the most used spices to season seafood in Spain is Saffron. Its perfume and aroma are so versatile that the spice is an inevitable choice once you used it the first time. But, what is Saffron? Where does it come from? There is not a better sight than a Crocus sprouting through the snow in the spring. Crocuses are a very popular bulb all over the world and are a very common sight in many gardens everywhere. However, as common as they seem, not many people know that behind this beautiful short-lived flower, is one of the most exotic spices known to man, saffron. 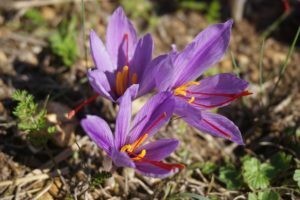 The Crocus from which saffron is obtained is a fall blooming one called Crocus Sativus, and it is used not only as a spice but also as a dye. It is considered a domesticated Crocus as you are not able to find it in the wild and, according to Wikipedia, has been traded and used for over four millennia. 90% of its production comes from Iran. 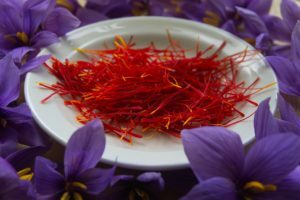 Saffron is widely used in Mediterranean food, especially Spanish and Portuguese food, and it is also widely known in North African countries like Morocco, where it is considered a staple in the food. Saffron brings beautiful color and aromas to your food, and only a few pistils are able to do the job. Saffron threads are dried from the original source so you have to let them hydrate and immediately the flavors come out and stay. It can also be combined with many herbs but cilantro does wonderful things when combined with saffron. Saffron can be used with any meats but it makes a great combination of seafood while it enhances all its flavors. In this new episode, the Capt’n shows a gorgeous example of how to use saffron in your food. 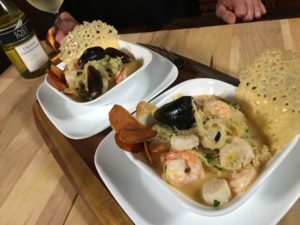 This recipe, Scallops, Shrimp and Mussels on Saffron Mashed Potatoes and Parmesan Crisps is a very delicate one, yet very easy to prepare. Scallops and Shrimp have always been Capt'n Kenny's favorite food and he has come up with many scallop recipes ideas as well as shrimp recipes ideas. This particular one, Scallop, Shrimp, and Mussels on Saffron Mashed Potatoes recipe, is inspired by Spanish cooking traditions, like Seafood Paella and many other seafood dishes that contain Saffron as a condiment. As always, thank you so much for all your comments via Facebook, our website, Twitter and Instagram. Please keep sending them! We love hearing from you and your experiences with our food. Shrimp, scallops, and Mussels on Saffron Mashed Potatoes. Scallops, Shrimp and Mussels on Saffron Mashed Potatoes and Parmesan Crisps. Make mashed potatoes by peeling and cutting the potatoes into small cubes, then boiling them until they are tender. About 15 minutes. Drain potatoes and mash with butter. In a separate pot add the whipping cream and bring it to a boil. Mix in the saffron threads and turn off the heat. Set aside for 10 minutes. After the 10 minutes, add the saffron and cream to the mashed potatoes and season with salt and pepper. Set aside. Pre-heat the over to 400 degrees F. On a baking sheet with parchment paper, distribute two tbsp of Parmesan cheese to form each crisp. Bake for 3 to 5 minutes until bubbling. Thinly slice 1 potato and mix with Olive Oil, Salt, and Pepper. Put on a baking sheet covered with parchment paper, then cover with more parchment paper and another baking sheet. Bake in the oven for 25 minutes. Saute Leeks for 3 minutes over medium heat. Add Chilis and sauté for 1 more minute. Add the wine and bring to a boil for 3 more minutes. Increase the heat and add the mussels to the Leeks for 3.5 minutes until open. Take the Leeks out of the pan and set aside. Decrease the heat again and add the Shrimp and scallops for 4 minutes. Remove and set aside. Reduce the Seafood liquid over light heat. Beat in 2 tbsp of butter and return the seafood to the pan and their juices. Season with Salt and Pepper and Plate. Because of time constraints, some tips from the Capt’n did not make it to the video: - Hot peppers: You can use any kind of hot peppers on the Scoville scale. However, try to remember others are eating your food and might not have a developed palate for spicy food. As with salt, you can always add spice afterward but you can not take it away from the food! - The amount of food you are going to put on the plate will always depend on who is eating. In the case of this recipe, most restaurants will serve two scallops, two shrimp and three of four mussels. However, the Capt’n likes to add more seafood and less mashed potatoes. It all depends on your taste. - With regards to the Spaniards and seafood mixed with meat. A lot of people would add Pancetta or bacon to this recipe. The Capt’n does not like to mix the sea with the earth. La Capitana, with her Spanish roots, loves mixing them. In the end, it is always a matter of taste, and the taste is free! - For the Lobster broth, the Capt’n always keeps the lobster heads, the shrimp shells and adds celery, onions, peppers and green onions to make a broth that can be kept frozen if not used completely for later opportunities. Just add whatever you have and have it simmer at low heat for one hour.